Beamed kitchen with seating for 4 people, integrated oven, modern electric hob, integrated fridge & washing machine, ironing facilities, Microwave. Well equipped. Use of TUMBLE DRYER. 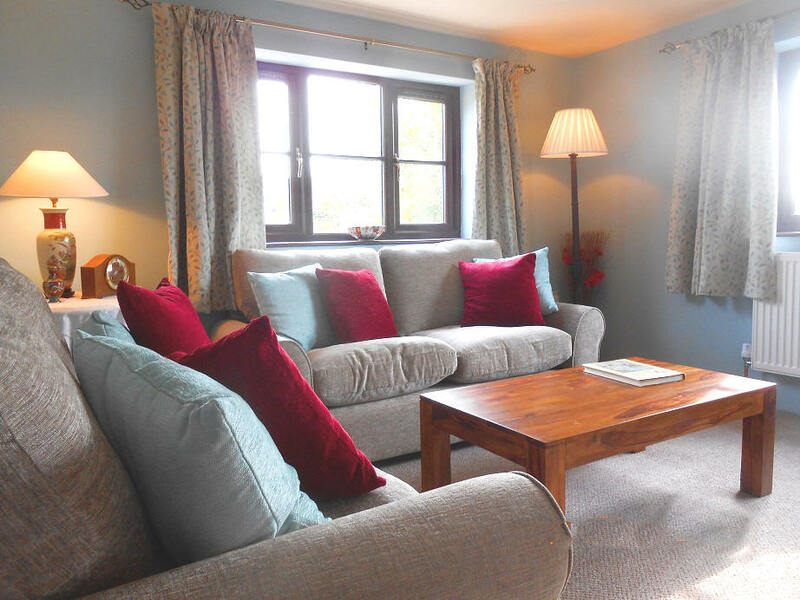 Double aspect sitting room with 2 sofas, TV with DVD, southerly & westerly views with stunning sunsets. WiFi. 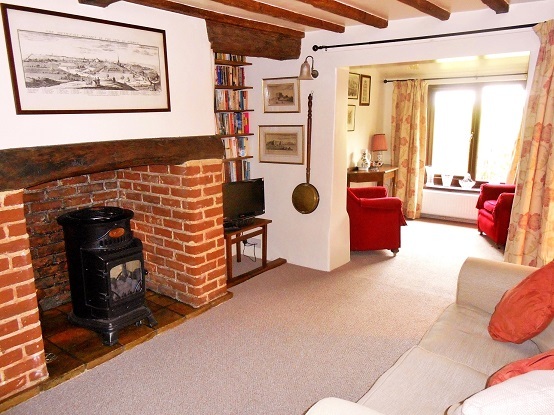 Homely, beamed snug with inglenook fireplace and wood burner effect stove, TV with DVD. WiFi. South facing sun room with garden views and access to private patio. Original narrow winding stairs to beamed landing. Pretty double bedroom with lovely views to the south & west and wonderful sunsets. Hairdryer, TV & DVD. Twin room with far reaching countryside views. Hairdryer, TV & DVD. Weaver's Way walk ¼ mile. Upstairs shower room with large shower. Shaver point. Southerly views over fields. Linen, towels, central heating and electricity included. Pure water from our bore. Sorry but we do not take pets. CHILDREN OVER 8 YRS ONLY. Beechwood Cottage snug through to south facing sun room Cottage Location. Standing off a quiet country lane, Beechwood Cottage, adjoining our home, is a traditional 18thc farm-worker’s cottage surrounded by over ½ acre of garden with mature trees with uninterrupted westerly views across beautiful open countryside with spectacular sunsets. Beamed snug with TV & wood burning effect stove and a varied stock of books, sitting room with stunning sunsets and southerly views, south facing sun room with garden views and access to private patio with seating. Well equipped kitchen & central heating, all combine with clean modern equipment and character features to create a warm homely atmosphere. Decorated and furnished to retain its unique cottage appeal with original narrow winding cottage stairs and some low doorways. 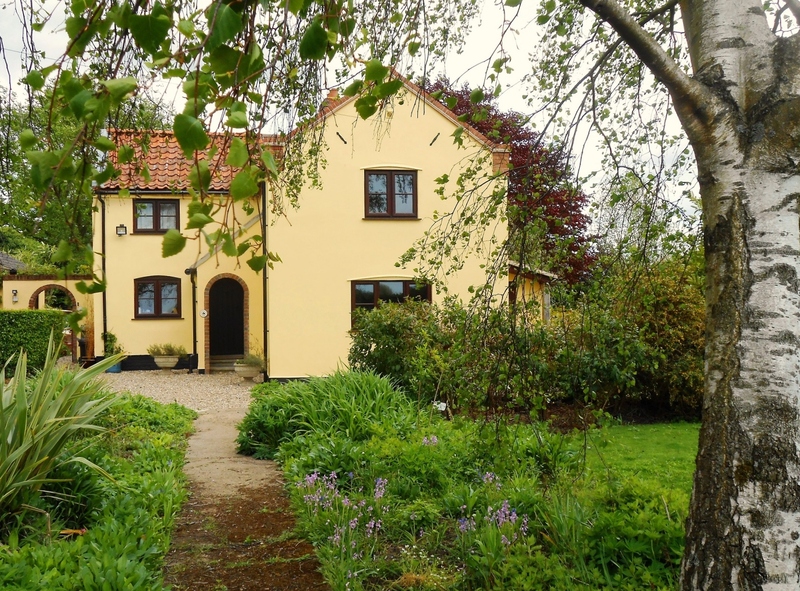 Alby is a small hamlet of scattered farms and cottages just 4 miles from the Broadland market town of Aylsham. With the coast just 5 miles away at Cromer, the Norfolk Broads and fine Cathedral city of Norwich within easy driving distance, Beechwood offers a quiet retreat from which to explore Norfolk. Cley marshes with its International reputation as one of Britain’s best sites for bird watching is only 30 minutes drive. Guests can enjoy boat trips to the Seal and Tern colonies at Blakeney and walks through Holt Country Park. The Weavers Way walk, just over the fields, takes you across Thwaite common, with many different species of birds and wild flowers, and on to the spectacular 17th c. Blickling Hall - surrounded by acres of National Trust land. There is a narrow gauge railway at Aylsham, travelling to Wroham on the Norfolk Broads.